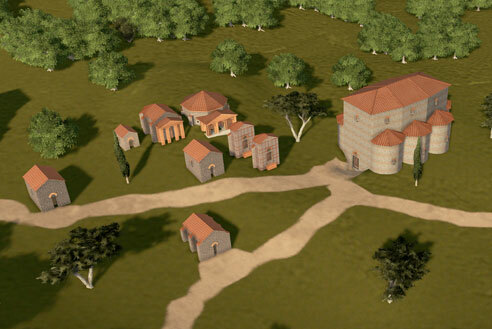 Modern day Pecs is built over the Roman city of Sopianae. 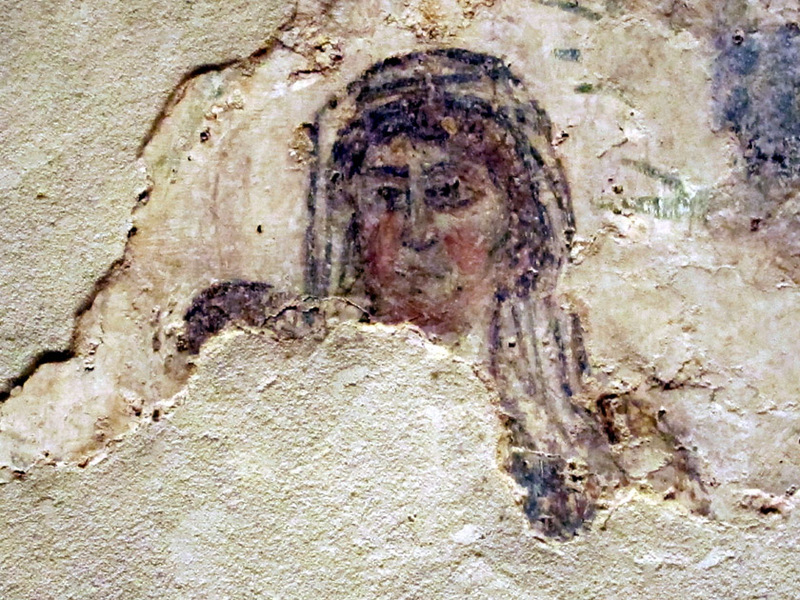 In the late 18th century, excavations discovered several elegantly frescoed, early Christian tombs that date to the 4th century. 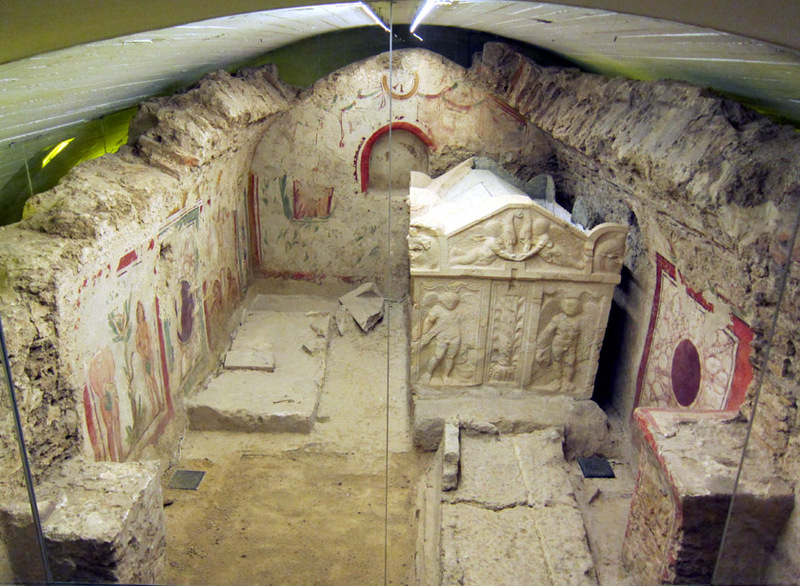 Given the extent, completeness of the site, decorations and overall high quality of the art and architecture, this cluster of 16 grave monuments of the Early Christian Necropolis of Sopianae were designated a UNESCO World Heritage Site in 2000. The so-called “Early Christian Mausoleum” along St. Stephen’s Square – just one component of the Pecs, Hungary UNESCO designated tomb complex. The sites themselves are scattered between a main museum and several satellites (because ancient Romans didn’t want to build their tombs that close together). The restoration and presentation of the tombs is excellent. The modern museum covers about 75% of the sites letting you wander from tomb to tomb. 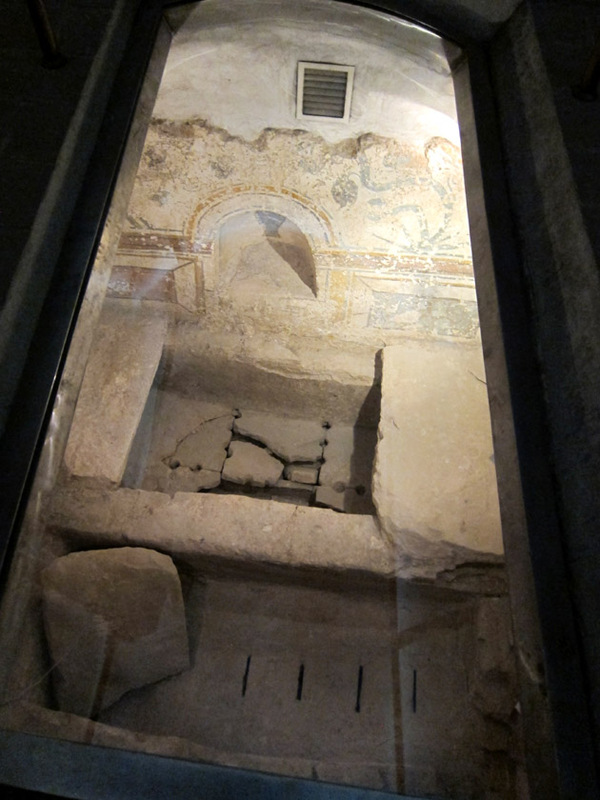 I really like the creative lay-out which let visitors view and even “pop into” the individual burial chambers. 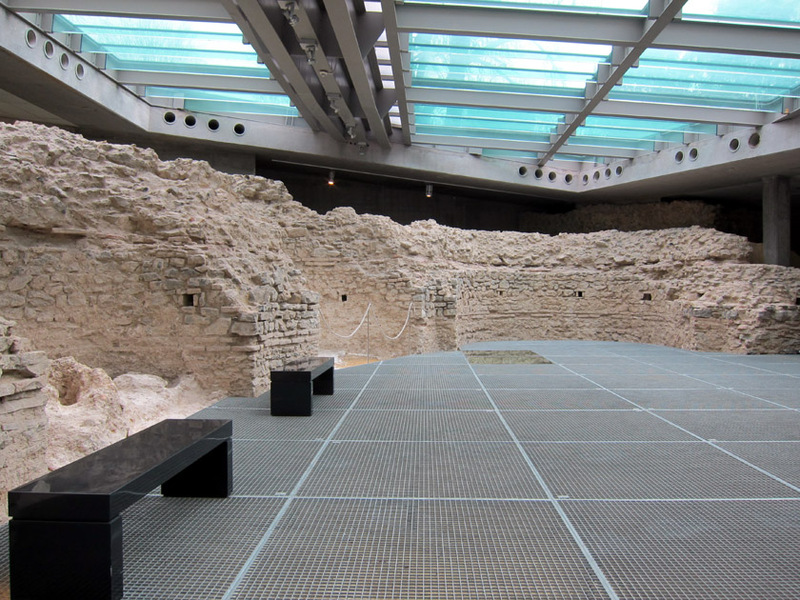 The foundations and lower walls of the Cella Septichora are preserved below street level. The largest building in the complex is the Cella Septichora. This long rectangular building has three semi-circular alcoves along each long wall and one behind the front altar area. Likely intended as a family mausoleum, it was converted to a church and became focal point for this hillside of tombs. All the other Sopianae tombs follow the same basic design: a subterranean room for the sarcophagus and a high-ceiling ground level room for feasting and celebration. 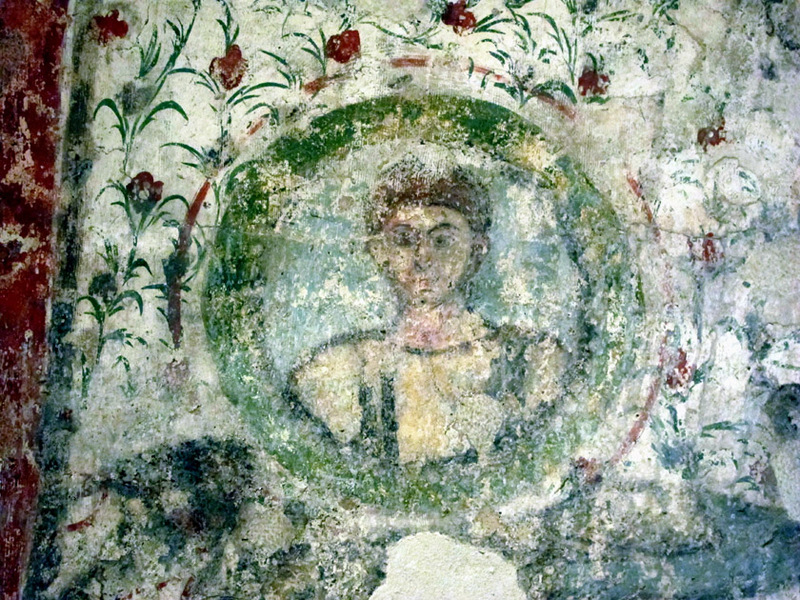 While the upper rooms may have been decorated, the only frescoes that remain today are from the basement, burial rooms. 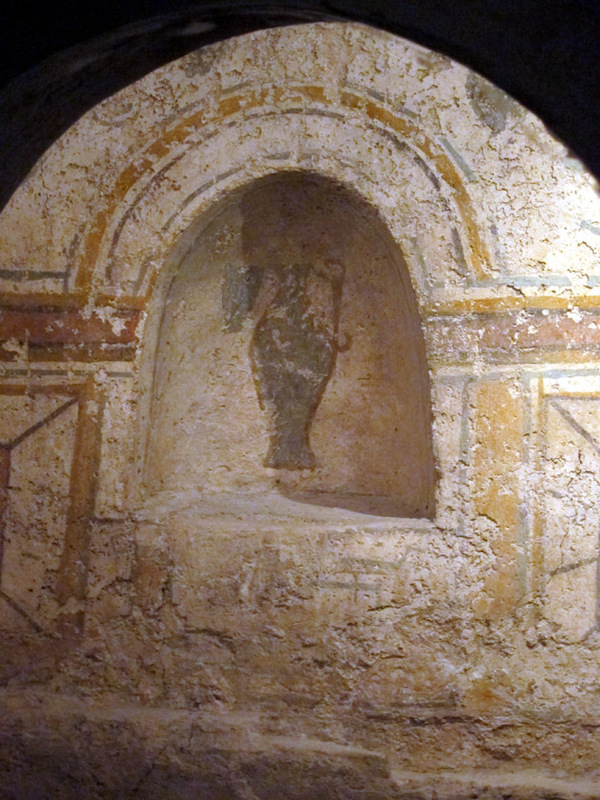 The Wine Pitcher Burial Chamber features this drinking vessel in a small alcove over the tomb. As you might guess from the name, the Wine Pitcher Burial Chamber features the image of a jug and a cup in small wall niche which you can see from the tomb’s front entrance. Since the barrel vaulted ceiling was found collapsed, it has been made into a sky-light to view into the tomb from the second story. Surrounded by the base of the walls, you get a sense for the small size of this free-standing mausoleum. 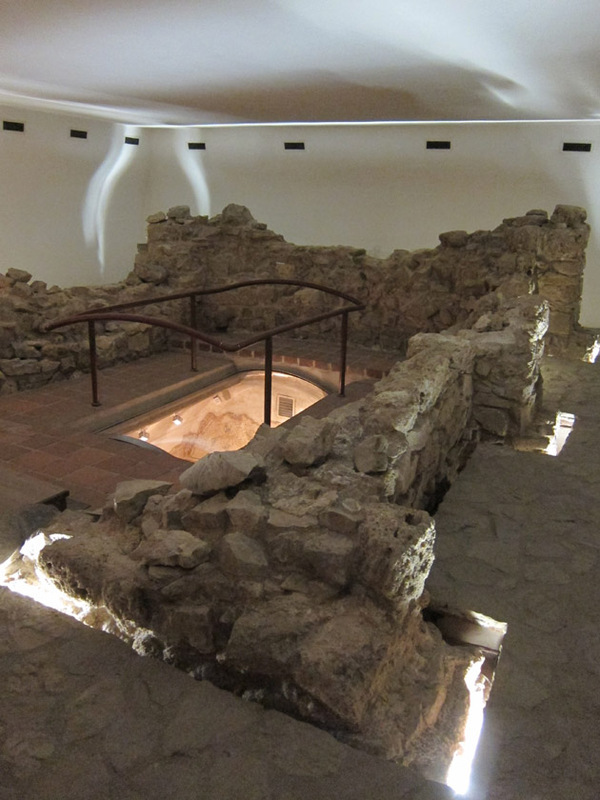 The stone foundation and walls show the two stories of the the Wine Pitcher Burial Chamber. The walls are painted with faux marble panels and vegetation. Garden imagery is very common in early Christian burial sites. The afterlife and Eden (or at least a botanical concept of paradise) are very strongly associated. 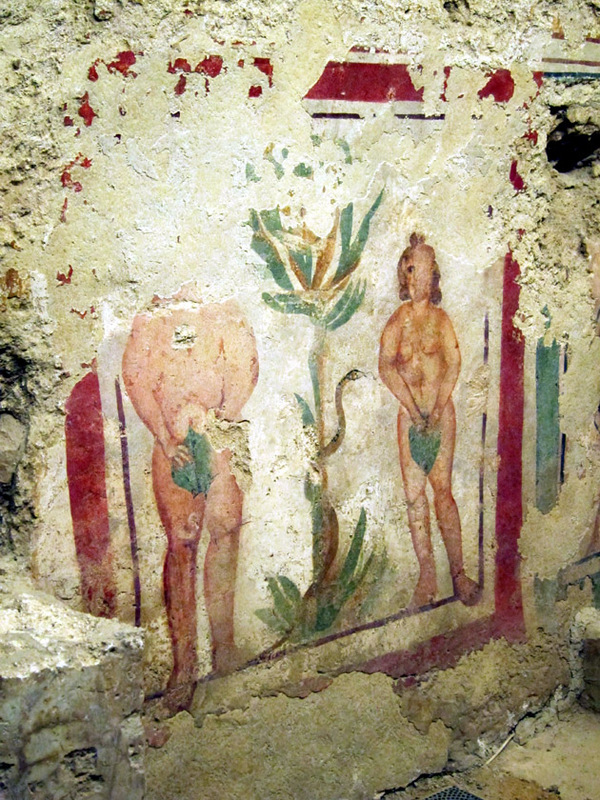 The garden paintings in the the Wine Pitcher Burial Chamber are more representative that naturalistic (unlike other Roman frescoes) but are still impressive for the bright colors and wall to wall coverage. 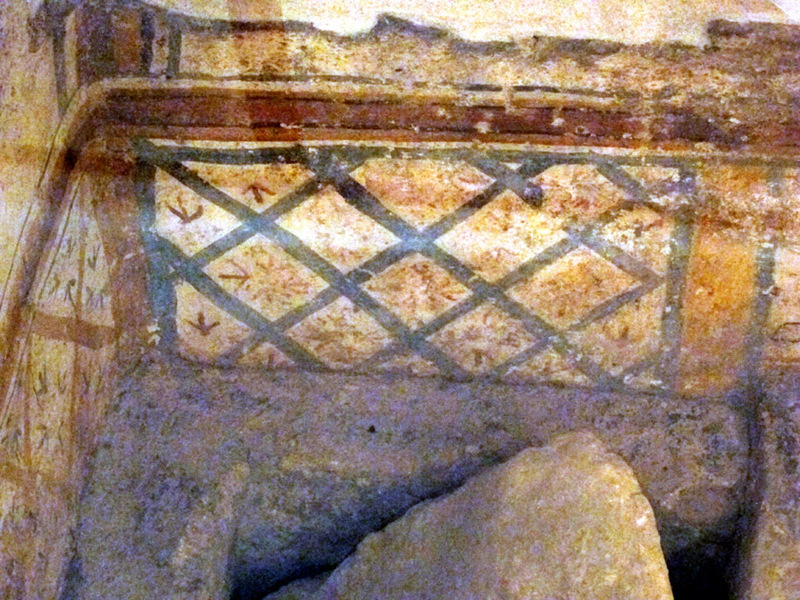 Garden lattice motif with plants symbolically pressing through the fence in The Wine Pitcher Burial Chamber. Saints Peter and Paul point to Christ’s monogram. The beautiful barrel-vaulted Saints Peter and Paul Burial Chamber is named after the front mural showing these men pointing to the Christogram. 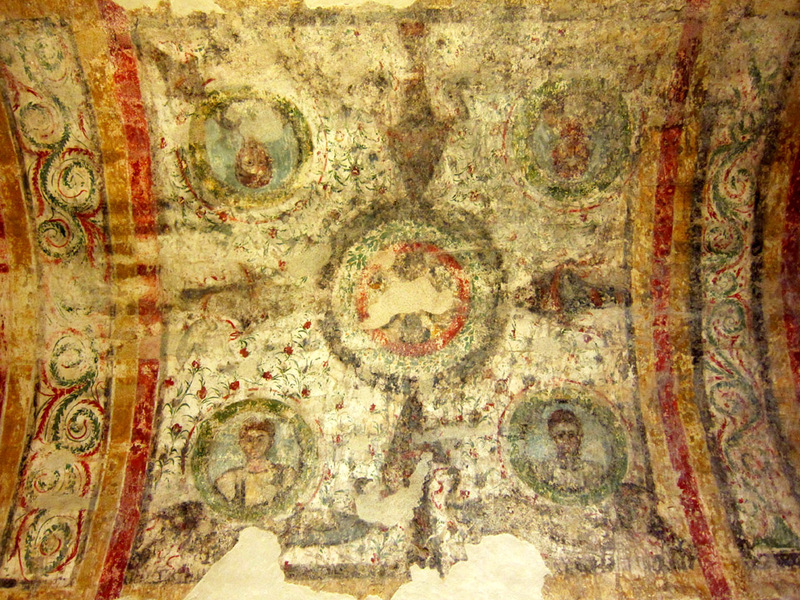 Along the ceiling are four male portraits that likely represent the deceased buried in this chamber. 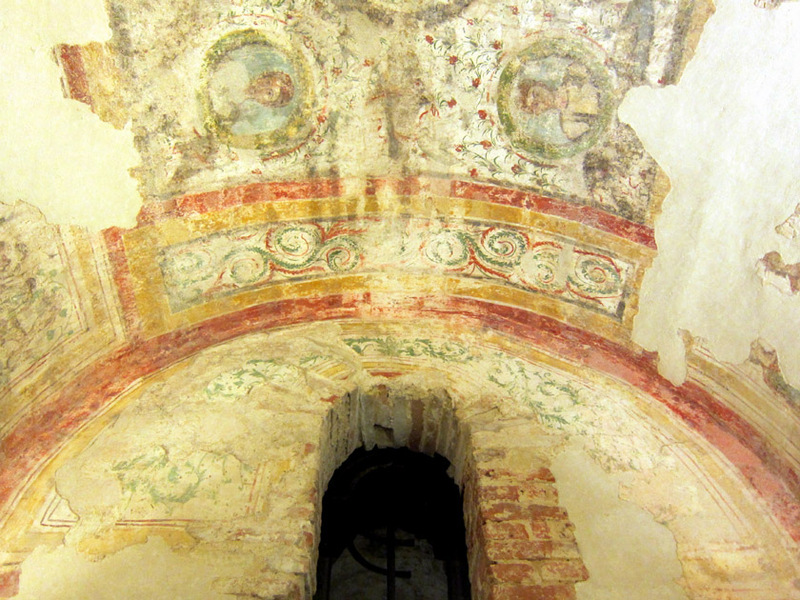 The back wall of the saints Peter and Paul Burial Chamber with vine designs. Surrounding these garlanded portraits are elaborate vines, plants, flowers, peacock, and pigeons. Once again, here we see more of the garden paradise imagery. The side walls have been damaged but they depict Biblical scenes, including an evocative Mary and Child, Jonah and the Whale, Adam and Eve, and three men in the fiery furnace. Just outside the main Sopianae museum complex is the (poorly named) Early Christian Mausoleum. The building’s footprint is approximately three times larger than other burial buildings; plus, it must have been very tall since the foundation shows that there were thick buttresses. The burial room was found to contain 22 individuals, both male and female, who ranged in age from early adult to the elderly. Christian Roman sarcophagus lid detail. The large sarcophagus in the back corner must have been installed first because there are no paintings on the walls around this coffin, presumably because the artist(s) couldn’t get to the wall to paint it. 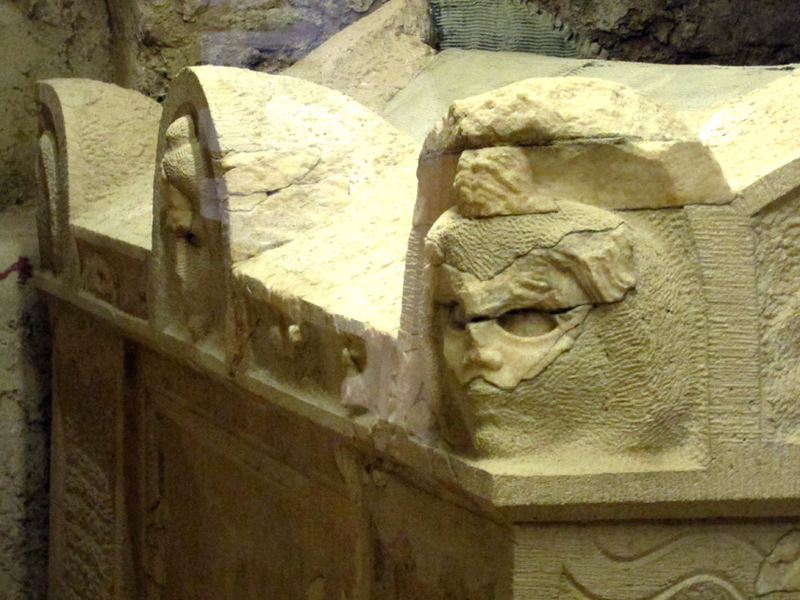 The large sarcophagus was found smashed in the tomb and has been reconstructed. What sets the Early Christian Mausoleum apart from the other Pecs tombs is the almost unbelievably good frescoes. 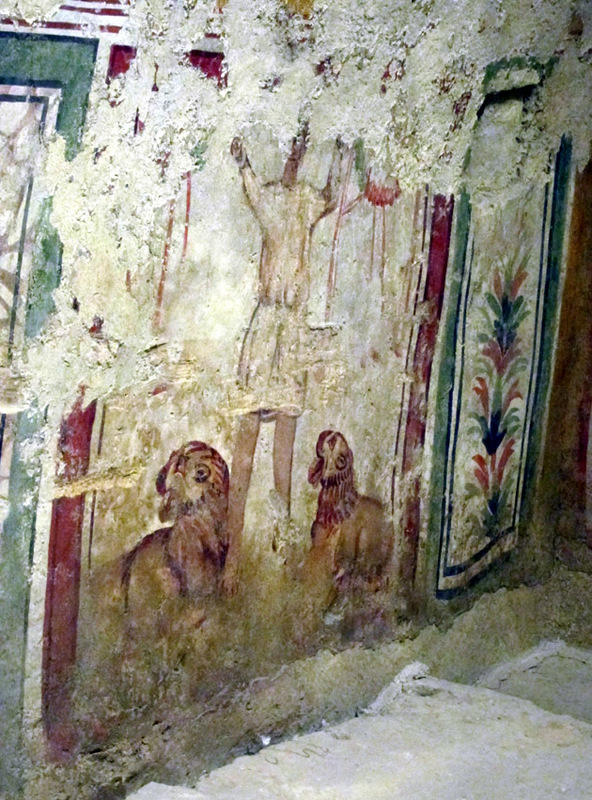 Daniel is shown with arms up-stretched in prayer as two lions roar at this feet. In another panel, Adam and Eve cover their thick bodies with leaves while a snake looks on. Adam and Eve do appear in the catacombs of Rome as one of the first set of early Christian images, but this scene is so bright and contains all the iconographic trappings we have come to expect from “the Fall”, that I have a hard time imagining this was painted in the mid-4th century AD. 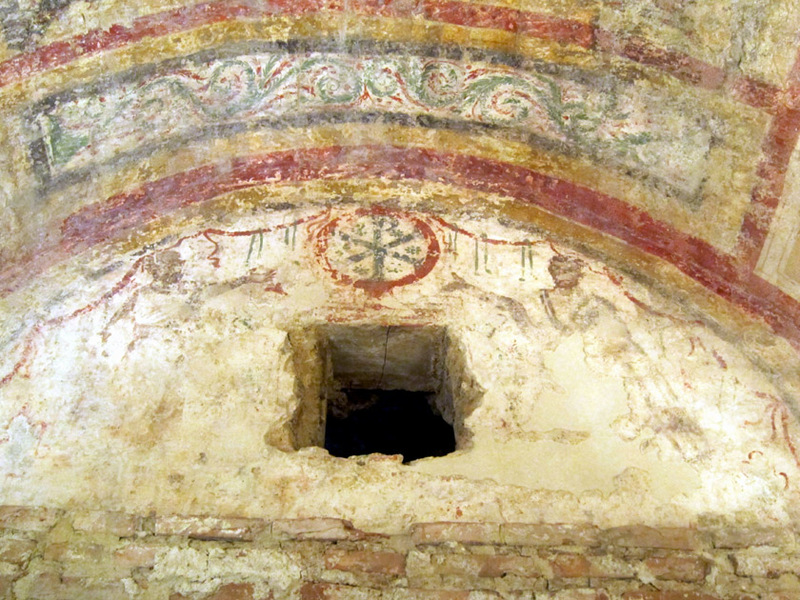 Not all the Sopianae tombs designated as part of this UNESCO Heritage Site are painted. 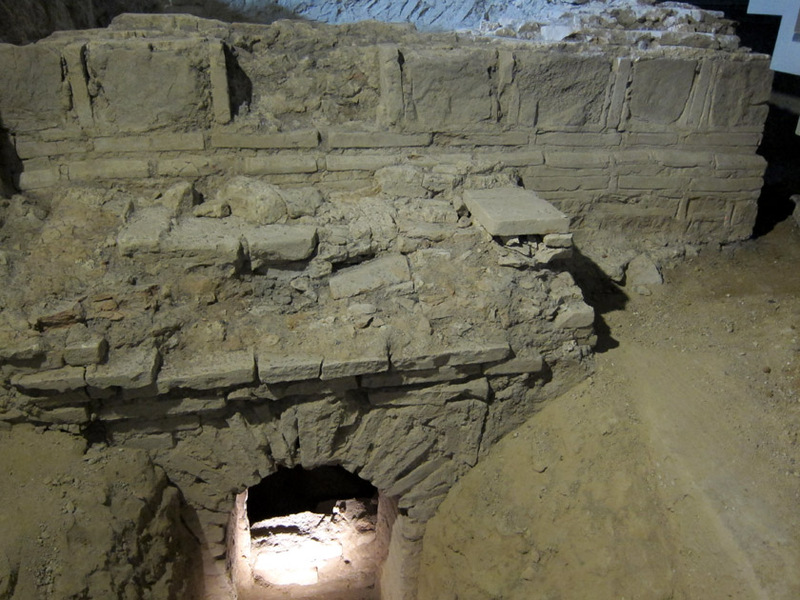 Some of the tomb are little more than their basement masonry. But even then, walking through the density of tombs gives you some sense of the ancient site. Rather than the prevalent body-niche tombs of the early Christian catacombs in Rome, ancient Sopianae had a boulevard of two-storied mausoleums. A smaller tomb with interesting masonry. 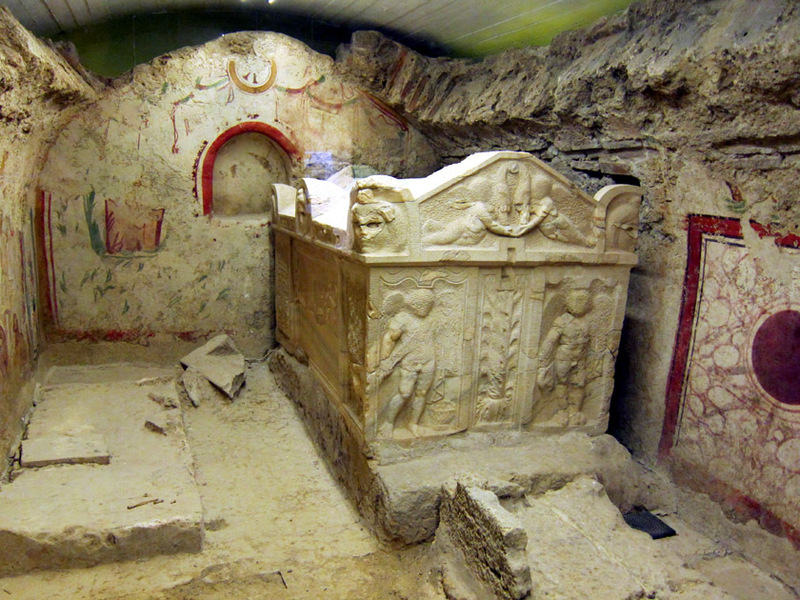 For more information on visiting the Early Christian Tombs, check out the museum’s website. I was not able to visit all the tombs as several of the satellite sites beyond the main museum complex were being renovated. Oh man, I’m totally salivating over this post! Very nice article. Thank you so much for your report.